Nestled in among the blooms in your garden bed, this clever bowl serves both function and fashion. It's a durable garden piece complete with a built-in basin for water. You may have seen fake rock décor in stores before that looks unreal and gives itself away as plastic. What excited us about the Boulder Wildlife Bowl is that it truly looks like real stone. 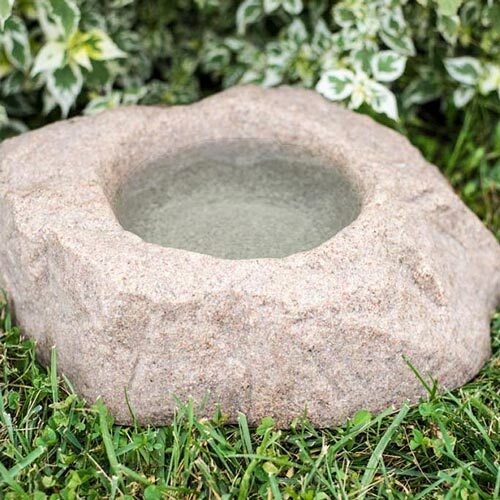 If you've got a pet who spends lazy afternoons in the yard, here's a nice way to make sure little Spot has access to water. Plus, when the days get hot and you're giving your stressed plants a little extra water, it'll be easy to just top up this little bowl, too. That way the wildlife that keeps your garden and neighborhood lively has a place to rehydrate too. 16" x 12" x 5"